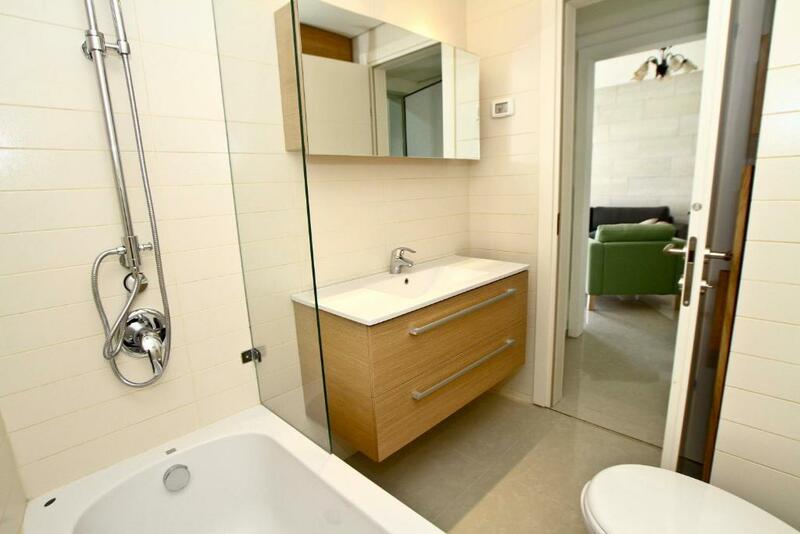 Apartment Charming Central Two Bedroom Apartment- Trumpeldor St.
Charming Central Two Bedroom Apartment- Trumpeldor St. Lock in a great price for Charming Central Two Bedroom Apartment- Trumpeldor St. – rated 9 by recent guests! Charming Central Two Bedroom Apartment- Trumpeldor St. is a self-catering accommodations located in Jerusalem. FreeWiFi access is available. The property is 1.2 mi from Western Wall and 1.3 mi from Dome of the Rock. Accommodations will provide you with a TV, a seating area and a DVD player. There is a full kitchen with a dishwasher and a microwave. Featuring a shower, private bathrooms also come with a bath and a bath or shower. You can enjoy city view. If you feel like visiting the surroundings, check out Church of All Nations (1.6 mi) and Garden of Gethsemane (1.6 mi).Ben Gurion Airport is located 25 mi away. 뀐 Located in the real heart of Jerusalem, this property has an excellent location score of 9.6! When would you like to stay at Charming Central Two Bedroom Apartment- Trumpeldor St.? This apartment features a TV, fully equipped kitchen and air conditioning. Free WiFi is included. Public parking is available at a location nearby (reservation is not needed) and costs ILS 51.88 per day. My place is locate at City Center, up to 5 min. walking distance to all places of interest. Its close to nightlife, public transport, Old City, Mahne Yehuda Market, etc. You’ll love my place because its new apt. with high standard at new building at Top location, and all super clean!! My place is good for couples, business travelers, and families (with kids). House Rules Charming Central Two Bedroom Apartment- Trumpeldor St. takes special requests – add in the next step! A ILS800 damage deposit is required on arrival (around USD222.59). This deposit will be fully refunded at check-out, as long as there isn't any damage to the property. A damage deposit of ILS 800 is required on arrival. That's about 222.59USD. This will be collected as a cash payment. You should be reimbursed on check-out. Your deposit will be refunded in full, in cash, subject to an inspection of the property. Please inform Charming Central Two Bedroom Apartment- Trumpeldor St. of your expected arrival time in advance. You can use the Special Requests box when booking, or contact the property directly using the contact details in your confirmation. See all guest reviews for Charming Central Two Bedroom Apartment- Trumpeldor St. Newest Reviews for Charming Central Two Bedroom Apartment- Trumpeldor St.